This article is about parasitic arachnids. For the symbol, see Check mark. For other uses, see Tick (disambiguation). Not to be confused with Tic. Ticks are small arachnids, typically 3 to 5 mm long, part of the order Parasitiformes. Along with mites, they constitute the subclass Acari. Ticks are ectoparasites (external parasites), living by feeding on the blood of mammals, birds, and sometimes reptiles and amphibians. Ticks had evolved by the Cretaceous period, the most common form of fossilisation being immersed in amber. Ticks are widely distributed around the world, especially in warm, humid climates. Almost all ticks belong to one of two major families, the Ixodidae or hard ticks, and the Argasidae or soft ticks. Adults have ovoid or pear-shaped bodies which become engorged with blood when they feed, and eight legs. As well as having a hard shield on their dorsal surfaces, hard ticks have a beak-like structure at the front containing the mouthparts whereas soft ticks have their mouthparts on the underside of the body. Both families locate a potential host by odour or from changes in the environment. Ticks have four stages to their lifecycle, namely egg, larva, nymph, and adult. Ixodid ticks have three hosts, taking at least a year to complete their lifecycle. Argasid ticks have up to seven nymphal stages (instars), each one requiring a blood meal. Because of their habit of ingesting blood, ticks are vectors of at least twelve diseases that affect humans and other animals. Fossilized ticks are known from the Cretaceous onwards, most commonly in amber. They most likely originated in the Cretaceous (146 to 66 million years ago), with most of the evolution and dispersal occurring during the Tertiary (65 to 5 million years ago). The oldest example is an argasid bird tick from Cretaceous New Jersey amber. The younger Baltic and Dominican ambers have also yielded examples which can be placed in living genera. The tick Deinocroton draculi has been found with dinosaur feathers preserved in Cretaceous Burmese amber from 99 million years ago. There are three families of ticks. The two large ones are the sister families of Ixodidae (hard ticks) and Argasidae (soft ticks). The third is Nuttalliellidae, named for the bacteriologist George Nuttall. It comprises a single species, Nuttalliella namaqua, and is the most basal lineage. Ticks are closely related to the mites, within the subclass Acarina. rDNA analysis suggests that the Ixodidae are a clade, but that the Argasidae may be paraphyletic. The Ixodidae contains over 700 species of hard ticks with a scutum or hard shield, which the Argasidae lack. The Argasidae contains about 200 species; the genera accepted as of 2010[update] are Antricola, Argas, Nothoaspis, Ornithodoros and Otobius. They have no scutum, and the capitulum (mouth and feeding parts) is concealed beneath the body. The family Nuttalliellidae contains only a single species, Nuttalliella namaqua, a tick found in southern Africa from Tanzania to Namibia and South Africa. The phylogeny of the Ixodida within the Acari is shown in the cladogram, based on a 2014 maximum parsimony study of amino acid sequences of twelve mitochondrial proteins. The Argasidae appear monophyletic in this study. Tick species are widely distributed around the world, but they tend to flourish more in countries with warm, humid climates, because they require a certain amount of moisture in the air to undergo metamorphosis, and because low temperatures inhibit their development from egg to larva. Ticks are also widely distributed among host taxa, which include marsupial and placental mammals, birds, reptiles such as snakes, iguanas and lizards, and amphibians.Ticks of domestic animals cause considerable harm to livestock by transmission of many species of pathogen, as well as causing anaemia and damaging wool and hides. Some of the most debilitating species occur in tropical countries. Tropical bont ticks affect most domestic animals and occur in Africa and the Caribbean. The spinose ear tick has a worldwide distribution, the young feeding inside the ears of cattle and wild animals. In general, ticks are to be found wherever their host species occur. Migrating birds carry ticks with them on their journeys; a study of migratory birds passing through Egypt found more than half the bird species examined were carrying ticks. The species of tick often differed between the autumn and spring migrations, probably because of the seasonal periodicities of the different species. For an ecosystem to support ticks, it must satisfy two requirements: the population density of host species in the area must be high enough, and humidity must be high enough for ticks to remain hydrated. Due to their role in transmitting Lyme disease, ixodid ticks, particularly the North American I. scapularis, have been studied using geographic information systems to develop predictive models for ideal tick habitats. According to these studies, certain features of a given microclimate – such as sandy soil, hardwood trees, rivers, and the presence of deer – were determined to be good predictors of dense tick populations. Ticks, like mites, are arthropods that have lost the segmentation of the abdomen that their ancestors had, and there has subsequently been a fusion of the abdomen with the cephalothorax. The tagmata typical of other Chelicera have been replaced by two new body sections, the anterior capitulum (or gnathosoma), which is retractable and contains the mouthparts, and the posterior idiosoma which contains the legs, digestive tract, and reproductive organs. The capitulum is a feeding structure with mouthparts adapted for piercing skin and sucking blood; it is only the front of the head and contains neither the brain nor the eyes. Features of the capitulum include the basis capitulum, palps and hypostome. The basis capitulum supports the rest of the feeding structures. Palps have a sensory role and are composed of three sections. The hypostome is used for blood extraction and is a hollow, tube-like structure. The ventral side of the idiosoma bears sclerites, and the gonopore is located between the fourth pair of legs. In the absence of segmentation, the positioning of the eyes, limbs and gonopore on the idiosoma provide the only locational guidance. Larval ticks hatch with six legs, acquiring the other two after a blood meal and molting into the nymph stage. In the nymphal and adult stages, ticks have eight legs, each of which has seven segments and is tipped with a pair of claws. The legs are sometimes ornamented and usually bear sensory or tactile hairs. In addition to being used for locomotion, the tarsus of leg I contains a unique sensory structure, Haller's organ, which can detect odors and chemicals emanating from the host, as well as sensing changes in temperature and air currents. A 2017 study showed that ticks can also use the Haller's organ to perceive infrared light emanating from a host. When not being used for walking, the legs remain tightly folded against the body. In nymphs and adults of the family Ixodidae, the capitulum is prominent and projects forwards from the body, a feature not present in the Argasidae. The eyes are close to the sides of the scutum, and the large spiracles are located just behind the coxae of the fourth pair of legs. The hard, protective scutellum, characteristic of this family, covers the whole dorsal surface in males but is restricted to a small, shield-like structure behind the capitulum in females and nymphs. They differ, too, in their life cycle; Ixodidae that attach to a host bite painlessly and generally unnoticed, and they remain in place until they engorge and are ready to change their skin; this process may take days or weeks. Some species drop off the host to moult in a safe place, whereas others remain on the same host and only drop off once they are ready to lay their eggs. The body of the soft tick, family Argasidae, is pear-shaped or oval with a rounded anterior portion. The mouthparts cannot be seen from above as they are on the ventral surface. The cuticle is leathery; there is often a centrally positioned dorsal plate, with ridges which project slightly above the surrounding surface, but there is no decoration. A pattern of small, circular depressed areas show where muscles are attached to the interior of the integument. The eyes are on the sides of the body, the spiracles open between legs 3 and 4, and males and females only differ in the structure of the genital pore. The Nuttalliellidae can be distinguished from both ixodid and argasid ticks by a combination of a projecting capitulum at the front and a soft, leathery skin. Other distinguish characteristics include the position of the stigmata, the lack of setae, the strongly corrugated integument, and the form of the fenestrated plates. Ticks satisfy all of their nutritional requirements as ectoparasites, feeding on a diet of blood. They are obligate hematophages, needing blood to survive and move from one stage of life to another. Ticks can fast for long periods but eventually die if unable to find a host. This behavior evolved approximately 120 million years ago through adaptation to blood-feeding. The behavior evolved independently in the separate tick families, with differing host-tick interactions driving the evolutionary change. Some ticks attach quickly while others wander around looking for thinner skin such as is found on the ears of mammals. Depending on the species and the life stage, preparing to feed can take from ten minutes to two hours. On locating a suitable feeding spot, the tick grasps the host's skin and cuts into the surface. They extract blood by cutting a hole in the host's epidermis, into which they insert their hypostome, and keep the blood from clotting by excreting an anticoagulant or platelet aggregation inhibitor. Ticks find their hosts by detecting animals' breath and body odors, or by sensing body heat, moisture and vibrations. They are incapable of flying or jumping, but many tick species, particularly Ixodidae, lie in wait in a position known as "questing". While questing, ticks cling to leaves and grasses by their third and fourth pairs of legs. They hold the first pair of legs outstretched, waiting to grasp and climb on to any passing host. Tick questing heights tend to be correlated with the size of the desired host; nymphs and small species tend to quest close to the ground where they may encounter small mammalian or bird hosts; adults climb higher into the vegetation where larger hosts may be encountered. Some species are hunters and lurk near places where hosts may rest. On receiving an olfactory or other stimulus, they crawl or run across the intervening surface. Other ticks, mainly the Argasidae, are "nidicolous", finding hosts in their nests or burrows, and in caves in the case of bats. They use the same stimuli as non-nidicolous species to identify hosts, with body heat and odors often being the main factors. Many of them feed primarily on birds, though some Ornithodoros, for example, feed on mammals. Both groups feed rapidly, typically biting painfully and drinking their fill within minutes. None of the species stick to the host in the way that hard ticks do. Unlike the Ixodidae that have no fixed dwelling place except on the host, they live in sand or in crevices near animal dens or nests, or in human dwellings where they come out nightly to attack roosting birds, or emerge when they detect carbon dioxide in the breath of their hosts. In the Ixodidae, the tick stays in place until it is completely engorged. Its weight may increase by 200 to 600 times as compared to its weight before it started feeding. To accommodate this large expansion, cell division takes place and its cuticle grows larger; the tick may remain attached for days or weeks, depending on species, life stage and host. In the Argasidae, the tick's cuticle stretches to accommodate the fluid ingested but does not grow new cells, the weight of the tick increasing five to tenfold over the unfed state. The tick then drops off the host and typically remains in the nest or burrow until its host returns to provide its next meal. Mites and nematodes feed on ticks, which are also a minor nutritional resource for birds. More importantly, they carry diseases as the primary hosts of pathogens such as spirochaetes, and without their agency, the organisms could not reach their secondary hosts. The diseases caused may debilitate their victims, and ticks may thus be assisting in controlling animal populations and preventing overgrazing. Certain infectious diseases of humans and other animals can be transmitted by ticks, the species of tick involved tending to be those with a wide host range. Spread of disease in this way is enhanced by the extended time during which a tick remains attached, during which time the mobile host can be carried long distances, or in the case of bird hosts, across the sea. The infective agents can be present not only in the adult tick but also in the eggs produced plentifully by the females. Many tick species have extended their ranges as a result of the movements of people, their pets and livestock. With increasing participation in outdoor activities such as wilderness hikes, more people and their dogs may find themselves exposed to attack. 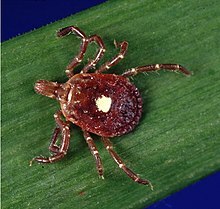 Both ixodid and argasid ticks have four lifecycle stages: egg, larva, nymph, and adult. 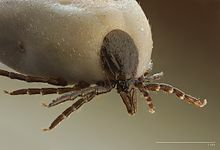 Ixodid ticks require three hosts, and their life cycle takes at least one year to complete. Up to 3,000 eggs are laid on the ground by an adult female tick. When the larvae emerge, they feed primarily on small mammals and birds. After feeding, they detach from their host and molt to nymphs on the ground, which then feed on larger hosts and molt to adults. Female adults attach to larger hosts, feed, and lay eggs, while males feed very little and occupy larger hosts primarily for mating. Argasid ticks, unlike ixodid ticks, may go through up to seven nymphal stages (instars), requiring a meal of blood each time. Their life cycles range from months to years. The adult female argasid tick can lay a few hundred to over a thousand eggs over the course of her lifetime. Larvae feed very quickly and detach to molt into nymphs. Both male and female adults feed on blood, and they mate off the host. During feeding, any excess fluid is excreted by the coxal glands, a process which is unique to argasid ticks. Ticks are implicated in the transmission of a number of infections caused by pathogens such as bacteria, viruses and protozoa. Sometimes the tick harbours more than one type of pathogen, making diagnosis of the infection more difficult. Species of the bacterium Rickettsia are responsible for typhus, rickettsialpox, Boutonneuse fever, African tick bite fever, Rocky Mountain spotted fever, Flinders Island spotted fever and Queensland tick typhus (Australian tick typhus). Other tick-borne diseases include Lyme disease and Q fever, Colorado tick fever, Crimean Congo hemorrhagic fever, tularemia, tick-borne relapsing fever, babesiosis, ehrlichiosis, Bourbon virus and tick-borne meningoencephalitis, as well as bovine anaplasmosis and probably the Heartland virus. Some species, notably the Australian paralysis tick, are also intrinsically venomous and can cause tick paralysis. Eggs can become infected with pathogens inside a female tick's ovaries, in which case the larval ticks are infectious immediately at hatching, before feeding on their first host. Tropical bont ticks transmit the rickettsial disease heartwater which can be particularly devastating in cattle. The ticks carried by migratory birds may act as reservoirs and vectors of infectious diseases. Over twenty strains of pathogenic virus were found in the autumn in the Egyptian migratory bird study. Not all ticks in an infective area are infected with pathogens, and both attachment of the tick and a long-feeding session seem to be necessary for transmission of these diseases to take place. Thus tick bites often do not lead to infection, especially if the ticks are removed within 36 hours. Adult ticks can be removed with fine-tipped tweezers or proprietary tick removal tools, disinfecting the wound. It is also possible to freeze them off with a medical wart remover. If the tick's head and mouthparts break off during removal, they can be removed with tweezers like a splinter. Research since 2008 has documented red meat allergies in the U.S. due to lone star tick bites. The range of the problem has been expanding with the range of the tick. Other species of ticks are suspected of being responsible for meat allergies in other countries, including Sweden, Germany, and Australia. With the possible exception of widespread DDT use in the Soviet Union, attempts to limit the population or distribution of disease-causing ticks have been quite unsuccessful. The parasitoid chalcid wasp Ixodiphagus hookeri has been investigated for its potential to control tick populations. It lays its eggs into ticks;[a] the hatching wasps kill their hosts. Predators and competitors of tick hosts can indirectly reduce the density of infected nymphs, thereby lowering tick-borne disease risk by lowering the density and/or tick burden of reservoir-competent hosts. A study in the Netherlands found that the number of larval ticks on bank voles and wood mice was lower at sites with a lot of red fox (Vulpes vulpes) and stone marten (Martes foina) activity. This supports the results of a study from the northeastern US, in which the incidence of Lyme borreliosis was negatively correlated with the density of red fox, which was suggested to be because foxes decrease the density of white-footed mice (Peromyscus leucopus), the most important reservoir-competent host for Borrelia burgdorferi in the US. Another natural form of control for ticks is the guineafowl, a bird species which consumes mass quantities of ticks. Topical tick medicines may be toxic to animals and humans. The synthetic pyrethroid insecticide Phenothrin in combination with the hormone analogue methoprene was a popular topical flea and tick therapy for felines. Phenothrin kills adult ticks, while methoprene kills eggs. However, some products have been withdrawn, while others are known to cause adverse reactions. ^ Micrographs of the wasp laying eggs into a tick, and the hole by which the young wasps emerge from the tick's dead body, are available in Plantard et al 2012. ^ Dunlop, Jason A.; et al. (2016). "Microtomography of the Baltic amber tick Ixodes succineus reveals affinities with the modern Asian disease vector Ixodes ovatus". BMC Evolutionary Biology. 16 (1): 203. doi:10.1186/s12862-016-0777-y. PMC 5057450. PMID 27724841. ^ Peñalver, Enrique; Arillo, Antonio; Delclòs, Xavier; Peris, David; Grimaldi, David A.; Anderson, Scott R.; Nascimbene, Paul C.; Pérez-de la Fuente, Ricardo (2017). "Ticks parasitised feathered dinosaurs as revealed by Cretaceous amber assemblages". Nature Communications. 8 (1): 1924. Bibcode:2017NatCo...8.1924P. doi:10.1038/s41467-017-01550-z. PMC 5727220. PMID 29233973. ^ Barker, S. C.; Murrell, A. (2004). "Systematics and evolution of ticks with a list of valid genus and species names". Parasitology. 129 (S1): S15–S36. doi:10.1017/S0031182004005207. ^ Klompen, J. S.; Black, W. C.; Keirans, J. E.; Oliver, J. H. (1996). "Evolution of ticks". Annual Review of Entomology. 41: 141–61. doi:10.1146/annurev.ento.41.1.141. PMID 8546444. ^ Anderson, John F. (2002). "The natural history of ticks". Medical Clinics of North America. 86 (2): 205–218. doi:10.1016/s0025-7125(03)00083-x. ^ Crampton, A.; McKay, I.; Barker, S. C. (May 1996). "Phylogeny of ticks (Ixodida) inferred from nuclear ribosomal DNA". International Journal for Parasitology. 26 (5): 511–517. doi:10.1016/0020-7519(96)89379-9. PMID 8818731. ^ Black, William C., IV; Piesman, Joseph (October 1994). "Phylogeny of hard- and soft-tick taxa (Acari: Ixodida) based on mitochondrial 16S rDNA sequences". PNAS. 91 (21): 10034–10038. Bibcode:1994PNAS...9110034B. doi:10.1073/pnas.91.21.10034. PMC 44952. PMID 7937832. ^ Gu, X. B.; et al. (2014). "The complete mitochondrial genome of the scab mite Psoroptes cuniculi (Arthropoda: Arachnida) provides insights into Acari phylogeny". Parasites & Vectors. 7: 340. doi:10.1186/1756-3305-7-340. PMC 4223567. PMID 25052180. ^ Dantas-Torres, Filipe; Oliveira-Filho, Edmilson F.; Soares, Fábio Ângelo M.; Souza, Bruno O. F.; Valença, Raul Baltazar P.; Sá, Fabrício B. (2008). "Ticks Infesting Amphibians and Reptiles in Pernambuco, Northeastern Brazil". Revista Brasileira de Parasitologia Veterinária. 17 (4): 218–221. doi:10.1590/S1984-29612008000400009. ^ "Ticks of Livestock". Ectoparasites of Livestock. Butox. Retrieved 14 January 2017. ^ a b "Ticks". Livestock Veterinary Entomology. Texas A&M AgriLife. Retrieved 14 January 2017. ^ a b Hoogstraal, Harry; Kaiser, Makram N.; Traylor, Melvin A.; Guindy, Ezzat; Gaber, Sobhy (1963). "Ticks (Ixodidae) on birds migrating from Europe and Asia to Africa, 1959–61". Bulletin of the World Health Organization. 28 (2): 235–262. PMC 2554471. PMID 13961632. ^ a b c Ruppert, Edward E.; Fox, Richard S.; Barnes, Robert D. (2004). Invertebrate Zoology, 7th edition. Cengage Learning. pp. 590–595. ISBN 978-81-315-0104-7. ^ "Common Ticks". Illinois Department of Public Health. Retrieved 11 April 2014. ^ "Soft ticks". CVBD: Companion Vector-Borne Diseases. Retrieved 6 December 2016. ^ For Haller's organ, see also: Mehlhorn (2008): p. 582. ^ Mitchell, R. D., III; Zhu, J.; Carr, A. L.; Dhammi, A.; Cave, G.; Sonenshine, D. E.; Roe, R. M. (2017). "Infrared light detection by the haller's organ of adult American dog ticks, Dermacentor variabilis (Ixodida: Ixodidae)". Ticks and Tick-borne Diseases. 8 (5): 764–771. doi:10.1016/j.ttbdis.2017.06.001. PMC 5588665. PMID 28647127. ^ Walker, Jane B.; Keirans, James E.; Horak, Ivan G. (2005). The Genus Rhipicephalus (Acari, Ixodidae): A Guide to the Brown Ticks of the World. Cambridge University Press. p. 39. ISBN 978-1-316-58374-6. ^ Salman, Mowafak Dauod; Tarrés-Call, Jordi; Estrada-Peña, Agustín (2013). Ticks and Tick-borne Diseases: Geographical Distribution and Control Strategies in the Euro-Asia Region. CABI. pp. 6–12. ISBN 978-1-84593-853-6. ^ a b "Soft ticks". CVBD: Companion Vector-Borne Diseases. Retrieved 6 December 2016. ^ Brouwers, Lucas (30 August 2011). "Long Lost Relative of Ticks Pops Up Again". Scientific American. Retrieved 4 December 2016. ^ a b "Life cycle of Hard Ticks that Spread Disease". Centers for Disease Control and Prevention. Retrieved 22 June 2013. ^ a b Klompen, Hans; Grimaldi, David (2001). "First Mesozoic Record of a Parasitiform Mite: a Larval Argasid Tick in Cretaceous Amber (Acari: Ixodida: Argasidae)" (PDF). Annals of the Entomological Society of America. 94 (1): 10–15. doi:10.1603/0013-8746(2001)094[0010:FMROAP]2.0.CO;2. ^ Mans, Ben J.; Louw, Abraham I.; Neitz, Albert W. H. (2002). "Evolution of Hematophagy in Ticks: Common Origins for Blood Coagulation and Platelet Aggregation Inhibitors from Soft Ticks of the Genus Ornithodoros". Molecular Biology and Evolution. 19 (10): 1695–1705. doi:10.1093/oxfordjournals.molbev.a003992. PMID 12270896. ^ a b c "Host seeking". CVBD: Companion Vector-Borne Diseases. Retrieved 8 December 2016. ^ "Hard ticks". CVBD: Companion Vector-Borne Diseases. Retrieved 6 December 2016. ^ Ray, C. Claiborne (28 May 2012). "The mighty tick". New York Times. Retrieved 15 December 2016. ^ a b "Disease transmission". CVBD: Companion Vector-Borne Diseases. Retrieved 9 December 2016. ^ Unsworth, N. B.; Stenos, J.; Graves, S. R.; et al. (2007). "Flinders Island spotted fever rickettsioses caused by 'marmionii' strain of Rickettsia honei, Eastern Australia". Emerging Infectious Diseases. 13 (4): 566–73. doi:10.3201/eid1304.050087. PMC 2725950. PMID 17553271. ^ "Q fever". Centers for Disease Control. Retrieved 7 November 2010. ^ "Heartland virus". 8 November 2018. ^ Feldman, Getty; Feldman, Lauree; Macnair, Patricia (6 March 2014). "All about ticks: why it's so important to remove a tick". Netdoctor. Retrieved 8 December 2016. ^ "Correct tick removal". 26 October 2015. Retrieved 27 January 2018. ^ "Tick removal". Lyme Disease Action. Retrieved 24 October 2014. ^ "Tick removal". Centers for Disease Control and Prevention. Retrieved 24 October 2014. ^ "Catalyst: Tick allergy – ABC TV Science". www.abc.net.au. 17 February 2015. Retrieved 10 December 2015. ^ "Tick Removal". Centers for Disease Control and Prevention. 1 June 2015. Retrieved 15 January 2017. ^ Aubrey, Allison (25 June 2018). "Red Meat Allergies Caused By Tick Bites Are On The Rise". NPR. Retrieved 26 June 2018. ^ a b Plantard, O.; et al. (2012). "Detection of Wolbachia in the tick Ixodes ricinus is due to the presence of the hymenoptera endoparasitoid Ixodiphagus hookeri". PLOS One. 7 (1): e30692. Bibcode:2012PLoSO...730692P. doi:10.1371/journal.pone.0030692. PMC 3266912. PMID 22292021. ^ Tijsse-Klasen, Ellen; et al. (2011). "Parasites of vectors – Ixodiphagus hookeri and its Wolbachia symbionts in ticks in the Netherlands". Parasites & Vectors. 4: 228. doi:10.1186/1756-3305-4-228. PMC 3248373. PMID 22152674. ^ a b Hofmeester, T. R.; Jansen, P. A.; Wijnen, H. J.; Copian, E. C.; Fonville, M.; Prins, H. H. T.; Sprong, H.; van Wieren, S. E. (2017). "Cascading effects of predator activity on tick-borne disease risk". Proceedings of the Royal Society B: Biological Sciences. 284 (1859): 20170453. doi:10.1098/rspb.2017.0453. PMC 5543215. PMID 28724731. ^ Levi, T; Kilpatrick, AM; Mangel, M; Wilmers, CC (2012). "Deer, predators, and the emergence of Lyme disease". PNAS. 109 (27): 10942–10947. Bibcode:2012PNAS..10910942L. doi:10.1073/pnas.1204536109. PMC 3390851. PMID 22711825. ^ "Hartz flea and tick drops for cats and kittens to be phased out". Environmental Protection Agency. Archived from the original on 11 January 2010. Retrieved 16 September 2011. Aeschlimann, André; Freyvogel, Thierry A. (1995). "Biology and distribution of ticks of medical importance". In Meier, Jürg; White, Julian (eds.). Handbook of Clinical toxicology of Animal Venoms and Poisons. 236. CRC Press. pp. 177–189. ISBN 978-0-8493-4489-3. Allan, Sandra A. (2001). "Ticks (Class Arachnida: Order Acarina)". In Samuel, William M.; Pybus, Margo J.; Kocan, A. Allan (eds.). Parasitic Diseases of Wild Mammals. Wiley-Blackwell. pp. 72–106. ISBN 978-0-8138-2978-4. Dennis, David T.; Piesman, Joseph F. (2005). "Overview of tick-borne infections of humans". In Jesse L. Goodman; et al. (eds.). Tick-borne Diseases of Humans. ASM Press. pp. 3–11. ISBN 978-1-55581-238-6. Duffy, David Cameron; Downer, Randall; Brinkley, Christie (1992). "The effectiveness of Helmeted Guineafowl in the control of the deer tick, the vector of Lyme disease" (PDF). Wilson Bulletin. 104 (2): 342–345. de la Fuente, José (2003). "The fossil record and the origin of ticks (Acari: Parasitiformes: Ixodida)". Experimental and Applied Acarology. 29 (3–4): 331–334. doi:10.1023/A:1025824702816. PMID 14635818. Goddard, Jerome (2008). "Tick-borne diseases". Infectious Diseases and Arthropods. Springer. ISBN 978-1-60327-399-2. Guglielmone, Alberto A.; Robbing, Richard G.; Apanaskevich, Dmitry A.; Petney, Trevor N.; Estrada-Peña, Agustín; Horak, Ivan G.; Shao, Renfu; Barker, Stephen C. (2010). "The Argasidae, Ixodidae and Nuttalliellidae (Acari: Ixodida) of the world: a list of valid species names" (PDF). Zootaxa. 2528: 1–28. doi:10.5281/zenodo.196488. Keirans, James E.; Clifford, Carleton M.; Hoogstraal, Harry; Easton, Emmett R. (1976). "Discovery of Nuttalliella namaqua Bedford (Acarina: Ixodoidea: Nuttalliellidae) in Tanzania and redescription of the female based on scanning electron microcopy". Annals of the Entomological Society of America. 69 (5): 926–932. doi:10.1093/aesa/69.5.926. Magnarelli, Louis A. (2009). "Global importance of ticks and associated infectious disease agents". Clinical Microbiology Newsletter. 31 (5): 33–37. doi:10.1016/j.clinmicnews.2009.02.001. Mehlhorn, Heinz; Armstrong, Philip M., eds. (2001). "Ticks". Encyclopedic Reference of Parasitology. Springer. pp. 608–638. ISBN 978-3-540-66819-0. Molyneux, D. H. (1993). "Vectors". In Cox, Francis E. G. (ed.). Modern Parasitology: a Textbook of Parasitology (2nd ed.). Wiley-Blackwell. pp. 53–74. ISBN 978-0-632-02585-5. Nicholson, William L.; et al. (2009). "Ticks (Ixodida)". In Mullen, Gary; Durden, Lance (eds.). Medical and Veterinary Entomology. Academic Press. pp. 483–532. ISBN 978-0-12-372500-4. Nuttall, George H. F. (1905). "Ticks and tick-transmitted diseases". Transactions of the Epidemiological Society of London. 24: 12–26. Roshdy, Mohamed A.; Hoogstraal, Harry; Banaja, Abdulelah A.; El Shoura, Samir M. (1983). "Nuttalliella namaqua (Ixodoidea: Nuttalliellidae): spiracle structure and surface morphology". Parasitology Research. 69 (6): 817–821. doi:10.1007/BF00927431. Sonenshine, Daniel E. (2005). "The biology of tick vectors of human disease". In Goodman, Jesse L.; et al. (eds.). Tick-borne Diseases of Humans. ASM Press. pp. 12–36. ISBN 978-1-55581-238-6. Wall, Richard; Shearer, David (2001). "Ticks (Acari)". Veterinary Ectoparasites: Biology, Pathology, and Control. John Wiley & Sons. pp. 55–82. ISBN 978-0-632-05618-7.